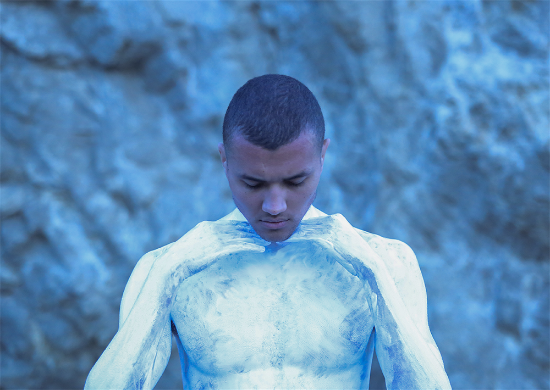 Today, Los Angeles artist Saro has released the 2nd single from his forthcomingsophomore EP. The track is titled “Eyelids” and it premiered with NYLONHERE. Focusing Saro’s signature dark pop through a fresh new lens of noir disco grandeur, “Eyelids” is another bold statement from the budding artist who is running full speed ahead with brand new material. Released December of last year, Saro’s debut EP, In Loving Memory, set the stage for his steady rise this spring, firmly establishing him as a force to be reckoned with. Driven by hit singles “Test” and “Looking,”the Robin Hannibal executive-produced EP is a deeply cathartic work exploring various stages of mourning. It saw widespread critical acclaim including Pigeons and Planes, who lauded its, “polished production, sweet melodies, and hooks fit for anthems.” In Loving Memory was released alongside a full visual EP experience of original videos for each of the EP’s 7 tracks. See the Full EP visual HERE. Saro first debuted his live show early 2017 with a run of LA support shows and stunned further audiences with his debut LA headline show at KCRW’s ‘School Night.’ He also performed at SXSW 2017, which saw buzz from outlets such as Buzzbands LA, DoLA and Billboard, who declared, “At every SXSW there’s the show that could be the ‘I saw them play for 30 people at South-By in [insert year] before anyone knew who they were,’ and this year’s just might be Saro.” Saro also recently played Brooklyn’s Northside Festival supporting Miguel, a performance weekend which FLAUNT Magazine chronicled HERE. Catch Saro next in Los Angeles this September. Additional fall west coast and northwest tour dates to be announced soon. Give “Eyelids” a listen now at the links below and stay tuned for more from Saro’s soon-to-be-named new EP, slated for a late summer 2017 release via Saro’s own label, Mateo Sound.